Today’s post will demonstrate that carton of eggnog in your fridge right now is not just for drinking. Though I adore a mug of eggnog while I sit by the twinkling lights of the Christmas tree, I wanted to branch out this year and use eggnog in a few different recipes. The first one that came to mind was Eggnog Cupcakes with an Eggnog Buttercream Frosting. They turned out to be a beautifully festive dessert perfect for the holidays. You’ll need 1/2 cup eggnog for the cupcake batter and 1/4 cup for the frosting. The eggnog makes the cupcakes moist and dense. I think my favourite part may be the frosting. I had several “taste tests” before it made its way onto the cupcakes. I had to make sure it passed the taste test! I always sprinkle nutmeg on top of my eggnog so I did the same with the cupcakes. 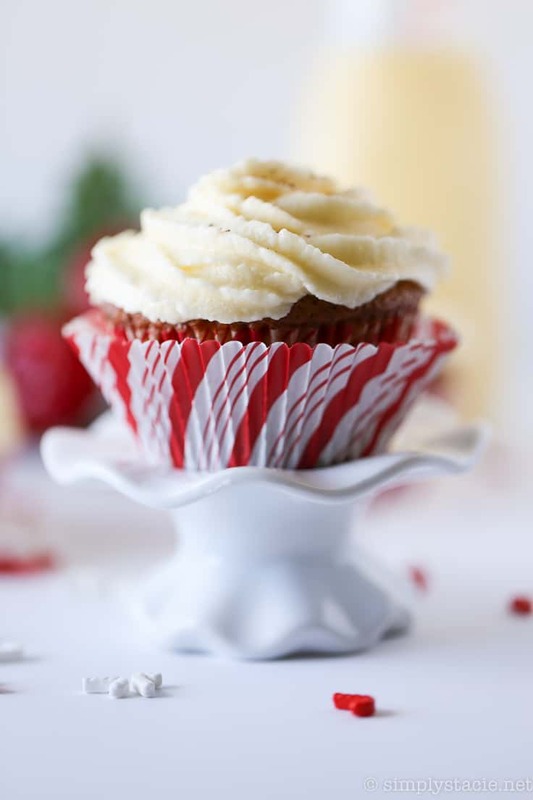 Your holiday baking will not be complete without a batch of these Eggnog Cupcakes. Save the recipe or pin it to your Christmas boards because trust me, you’ll want to make them before Christmas! My daughter, Bridget, who normally despises eggnog ate a bunch and even took one to school for lunch. I didn’t tell her they were Eggnog Cupcakes though. Eek! I knew she wouldn’t even try them if she had known. Maybe her tastes are changing because she loved this recipe. If you have any recipes that use eggnog, I’d love to hear about them. I’m always looking for yummy ways to bake with our favourite holiday beverage! 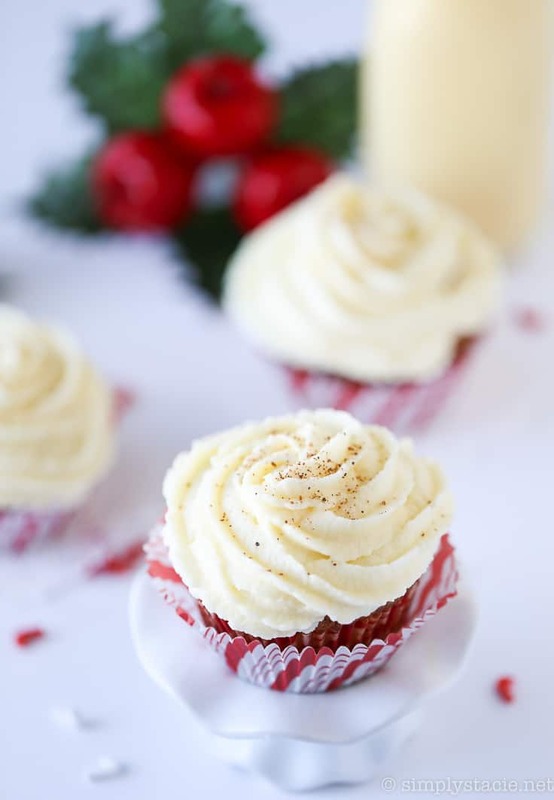 Have a bite of Christmas with this simple dessert recipe for Eggnog Cupcakes! It has eggnog in the cupcake AND the frosting. Preheat oven to 350F. Line a cupcake pan with paper liners. Add flour, nutmeg, baking powder, baking soda and salt in a large bowl and stir to combine. In another bowl add butter and sugar and beat with an electric mixer on medium until creamy. Add in eggs, one at a time, continuing to beat. Then add in the eggnog and beat to combine. Pour wet mixture into dry mixture and stir to combine. Spoon batter into muffin tin, about 3/4 way full. Bake for 25 minutes or until a toothpick comes out clean. Allow to cool for 10 minutes before transferring to a wire rack. Once cooled completely, you are ready to frost the cupcakes. Cream the butter and powdered sugar together with an electric mixer on medium. Add in eggnog and vanilla extract and cream till smooth. Scoop icing into a pastry bag with a large tip to frost the cupcakes. Start from the outside edge and work your way towards the centre. Sprinkle with nutmeg, if desired. 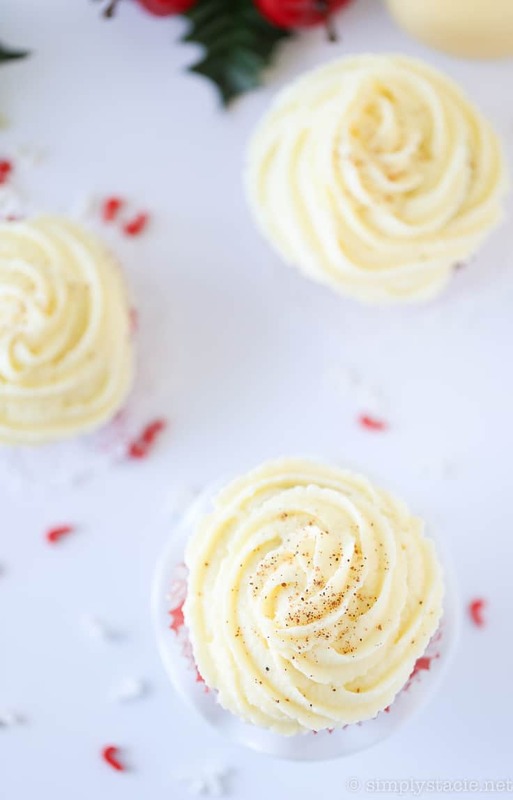 I would have never thought about turning eggnog into cupcakes! That’s brilliant! 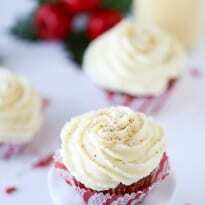 I love eggnog, and I love cupcakes with buttercream frosting (especially the way you swirl it on top of the cupcake)!!! The recipe has been printed, and I will soon be on my way to the store! They look heavenly! What a great idea, making an egg nog frosting- maybe I’ll just make the frosting and eat it from the bowl for a quick snack, haha. Stacie, those cupcakes look amazing! 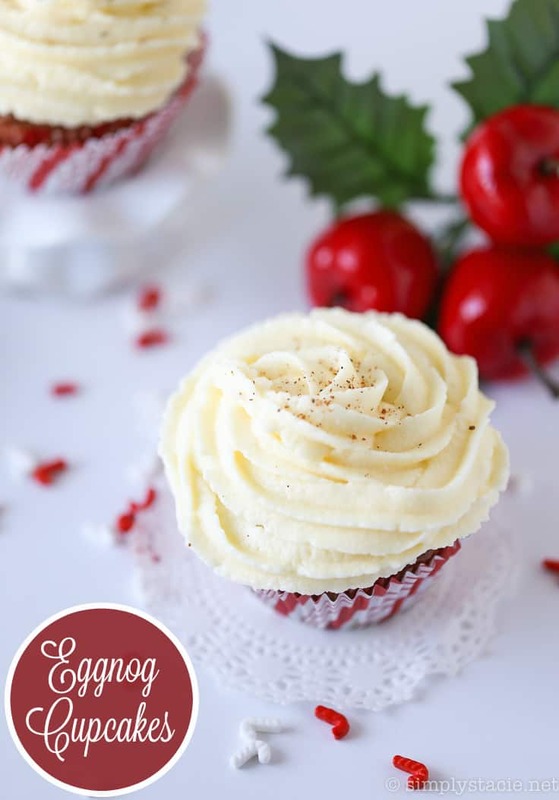 These Eggnog Cupcakes look heavenly, yum, yum, thanks for sharing! My husband loves eggnog – this would be a great treat for him thanks! 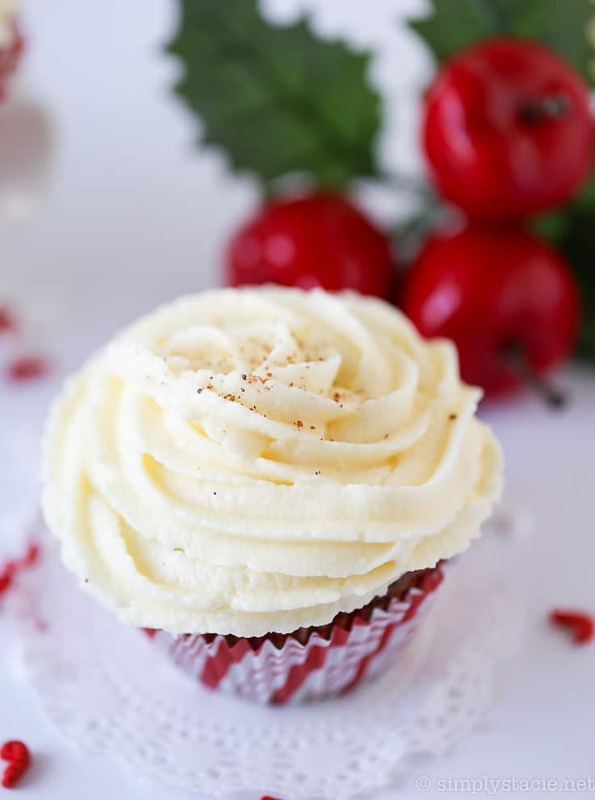 This is a very delicious looking cupcake recipe! They look perfectly festive and I am going to try some for my Christmas dinner because my grandchildren will love them. Absolutely amazing!! 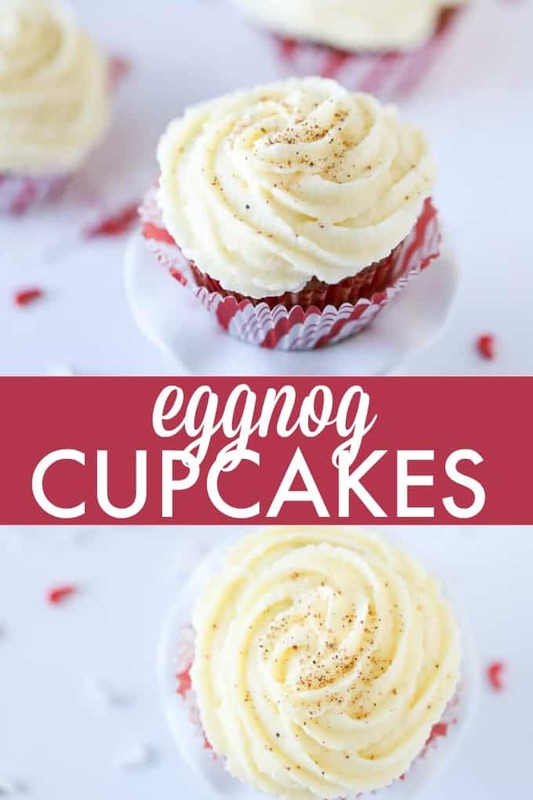 I love eggnog I love cupcakes but have never tried the combo of the two. this is a perfect dessert for the holidays! This looks like such a delicious and appealing idea for the holidays. I like the nutmeg garnishing the most. My hubby loves Eggnog so I am definitely going to have to try making these! Hi, Stacie – oh boy, do those sound good! Thanks for sharing your recipe and your gorgeous photos! 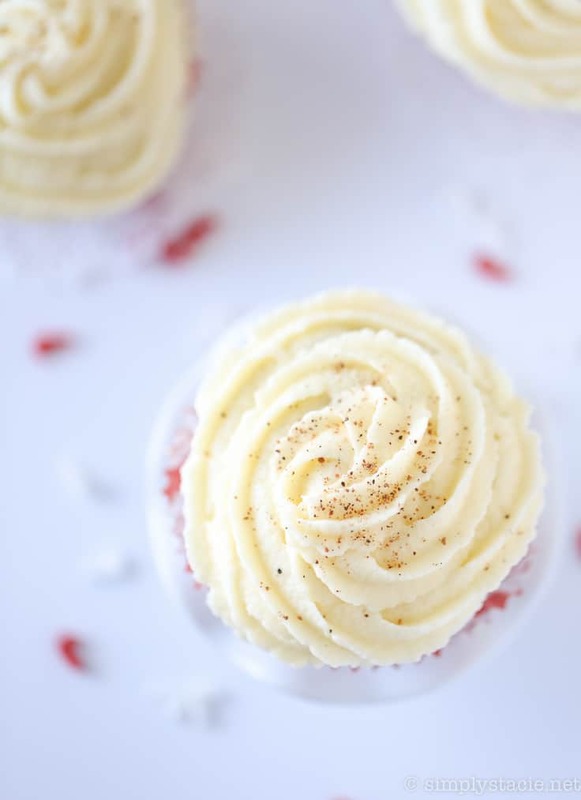 Your Eggnog cupcakes sound so delicious. Thanks for sharing on Wonderful Wednesday blog hop. Oh, goodness, I wish I was any good at cooking so I could whip these up! I’ll definitely be printing out the recipe to try out this holiday… thank you so much! Your Eggnog Cupcakes look delicious. Thanks so much for sharing with us at Full Plate Thursday and hope you are having a great holiday season! Wow! I’m not a fan of eggnog, but your cupcakes look amazing! Thanks for joining us for Friday Favorites. I’m featuring you this week! Are there any reviews of actually making and eating these? Yes, they look pretty, but how do they taste?